We stayed in Indianapolis, Indiana for 3 nights. That is a long time for us on a road trip. We stayed with our friends and former neighbors. This morning we drove south to Columbus, Indiana. This is a small town, but many artists and architects have done fantastic work here. Our first stop in Columbus was the Visitor’s Center. 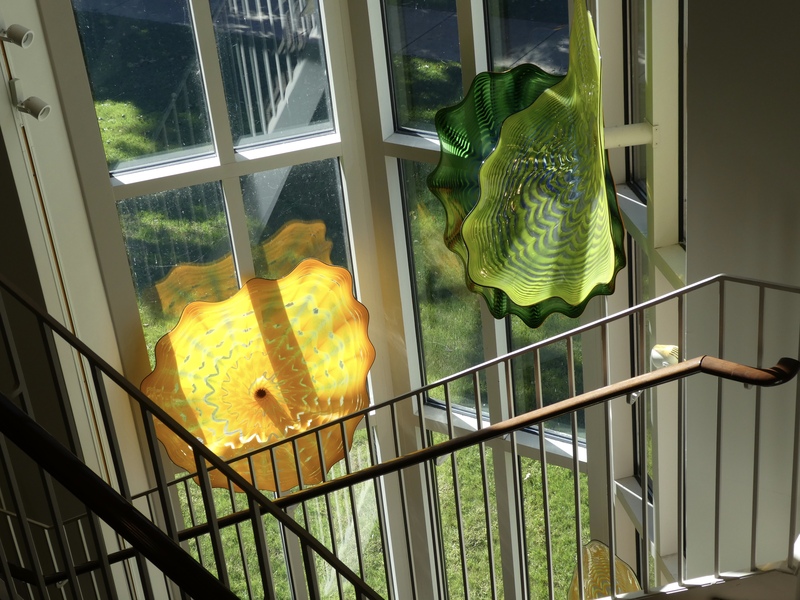 In the Visitor’s Center, we saw this beautiful glass sculpture. 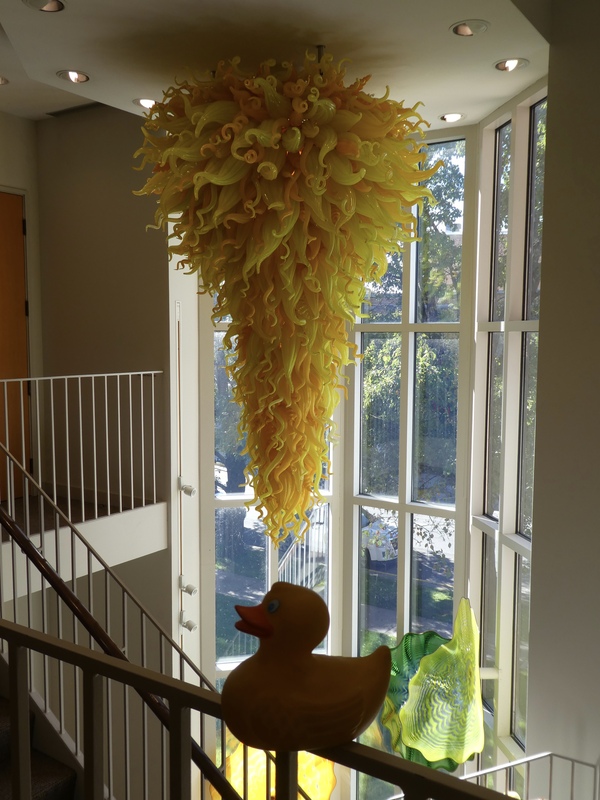 Dale Chihuly, the famous glass sculptor, created this. It was spectacular, with sun streaming through windows and through the glass. There were other, smaller works of art by Dale Chihuly. His work is beautiful. There are traveling displays of his work and some permanent displays, such as this one. If you are near some of his glass creations, please stop to take a look. Columbus is known for unusual architecture. There are tours that take humans around town and show different buildings and tell about them. We wanted to take a tour, but we were too late. Next time we will arrive earlier. We purchased a map and drove around town. We did see many things, but next time, the tour for us. Driving through town, following our map, we saw some great buildings and sculptures. 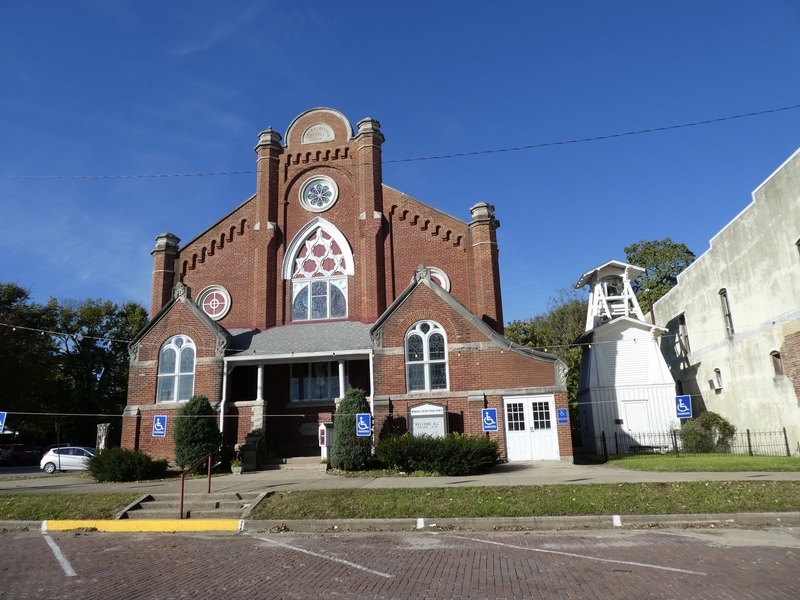 North Christian Church, one of 7 National Historic Landmarks in Columbus, was our first photo stop. Architects used new and unusual designs here in Columbus. 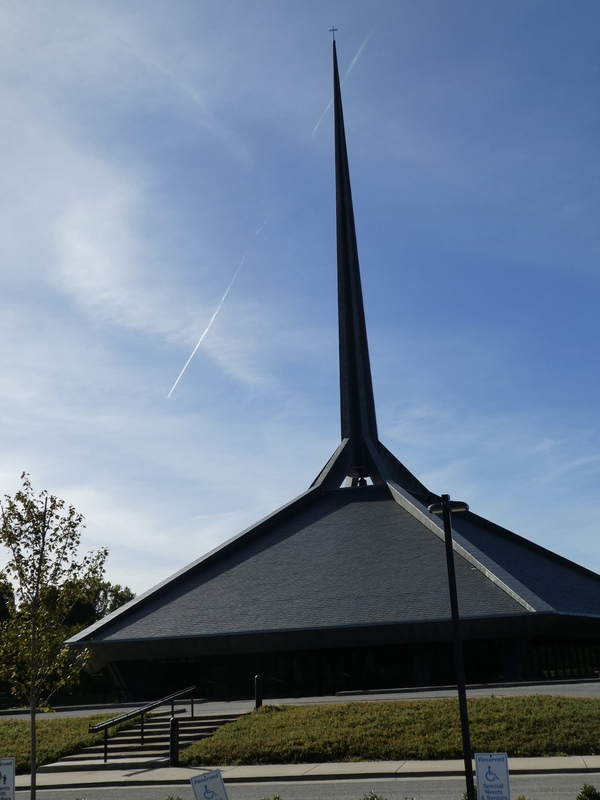 North Christian Church was designed by Eero Saarinen, while Dan Kiley was the landscape architect. 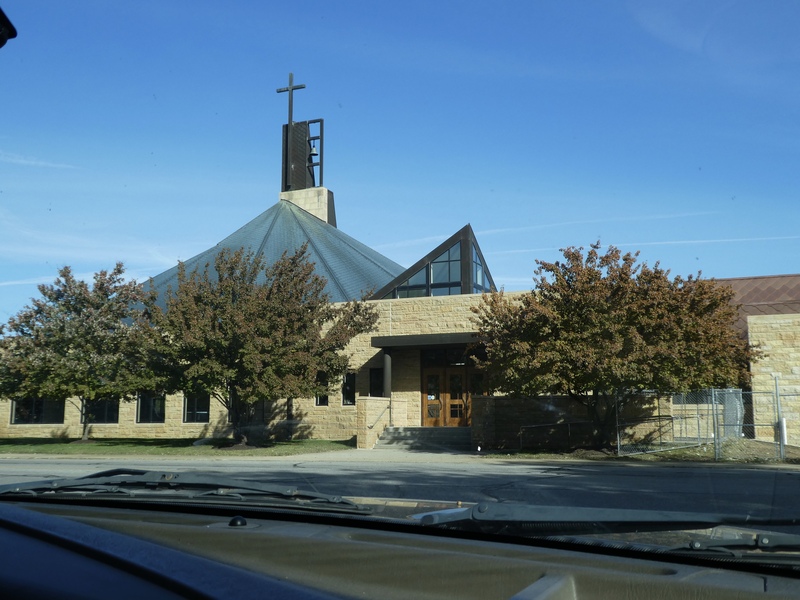 Our next stop was St. Bartholomew Catholic Church. The architects were William Browne, Jr and Steven R. Risting. 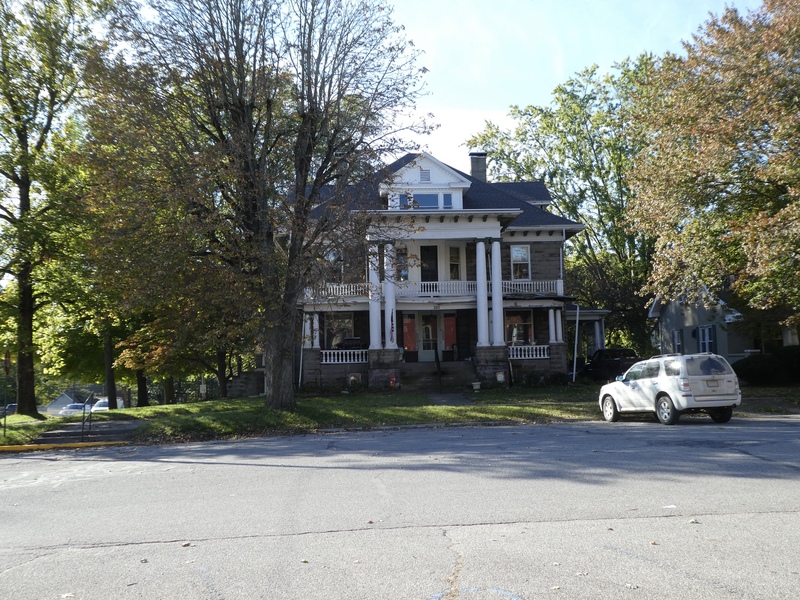 When you visit Columbus, take the tour, buy the map and drive, or walk through the downtown section. Better, yet, do a combination of all three. But, now for the real reason for this road trip and our extended time in Indiana. My friend and former neighbor, Liam, is a senior at Indiana University in Bloomington, Indiana. Liam is a very accomplished musician. He is majoring in music composition. We came for his senior recital. 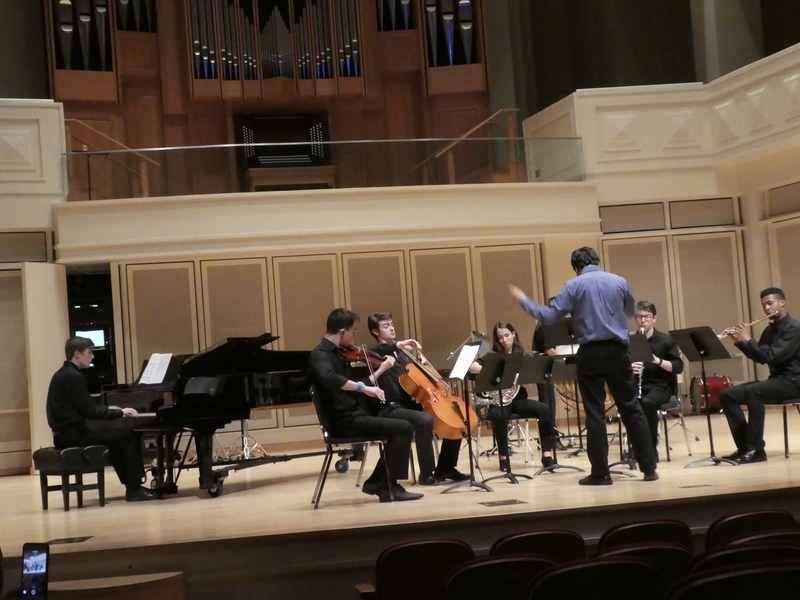 Here, a small group of musicians, are playing one of his compositions. 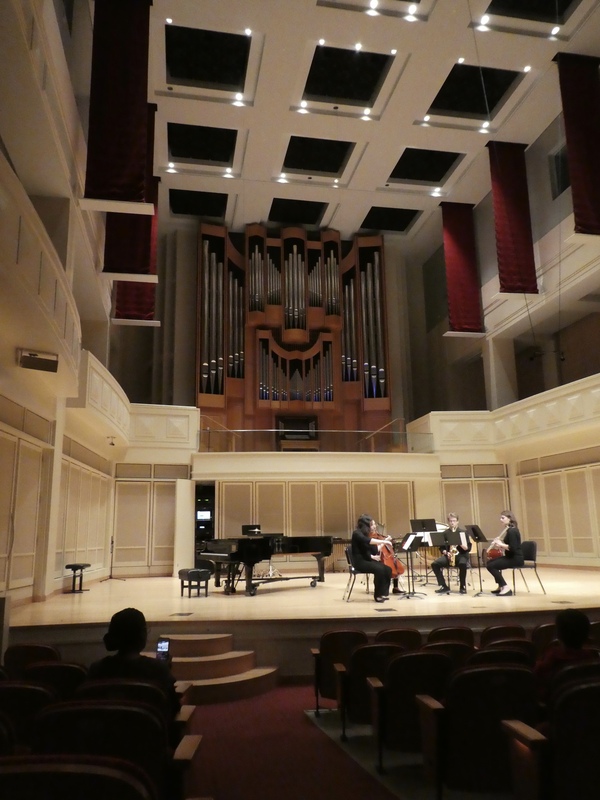 The University of Indiana has a great music program. 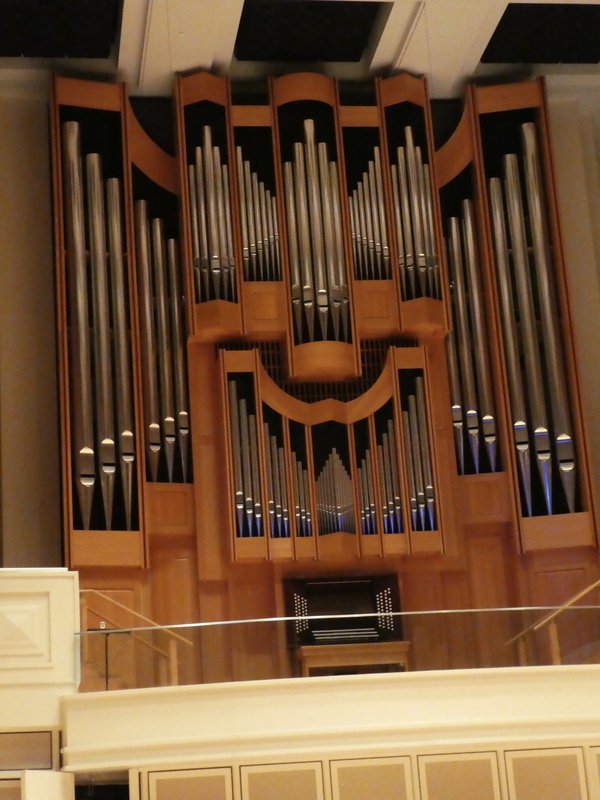 And as you can, a great pipe organ. This is the room for Liam’s recital. Liam, the composer, is directing another of his compositions. Liam attended Denver School of the Arts for high school. 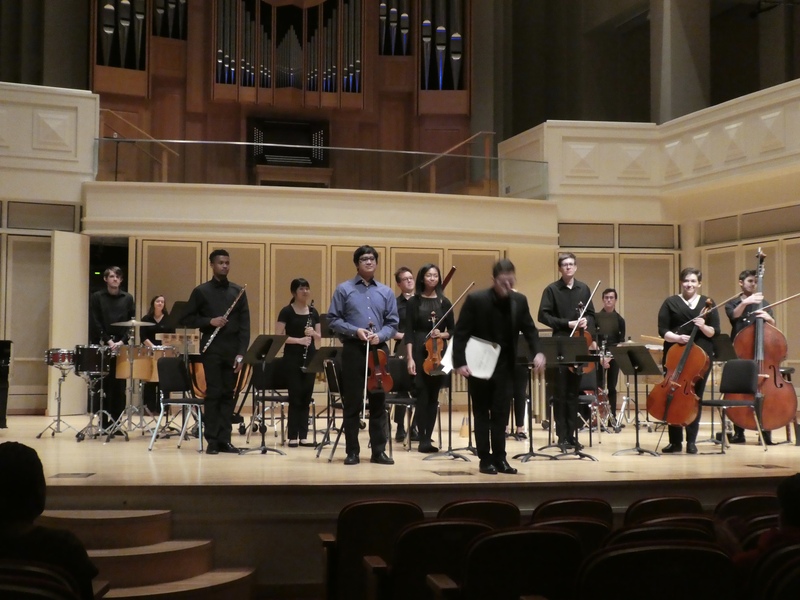 During that time, he composed pieces that were performed during the end of year concerts. After this piece, Liam, is recognized by the audience. I, Zeb the Duck, am so excited to see Liam on the stage again. Liam not only composes, and that means he writes the music for each instrument in the orchestra, but he is an accomplished violin player as well. This piece was not only composed by Liam, but Liam also performed in the orchestra. 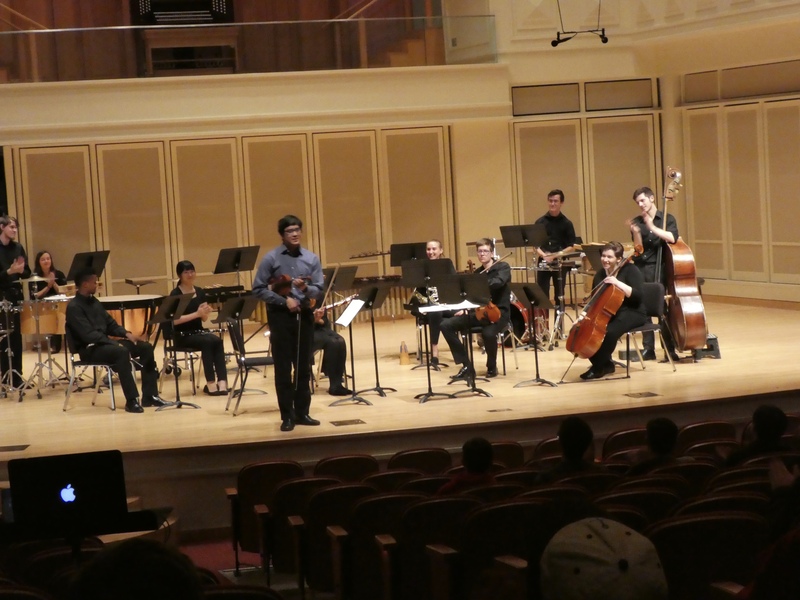 Since Liam was performing, a guest conductor was invited to lead the orchestra for this piece. I, Zeb the Duck, am so proud of my friend, Liam. Mom and all the humans are also very proud of Liam. This was a wonderful evening for us. Liam’s parents furnished food after the recital, so there were many there to congratulate Liam and lots of pleasant conversation. Let’s race. 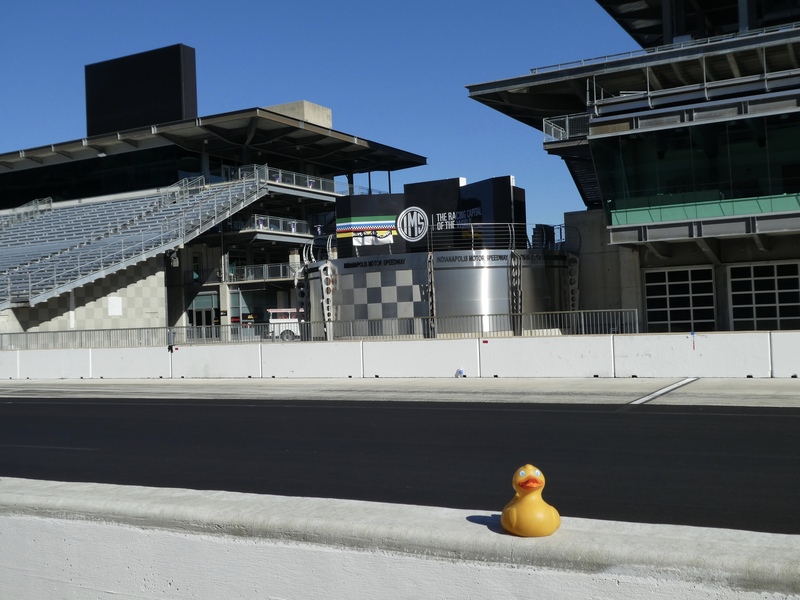 I, Zeb the Duck, am ready to tour the Indianapolis Motor Speedway. This is an exciting place and famous for many races. 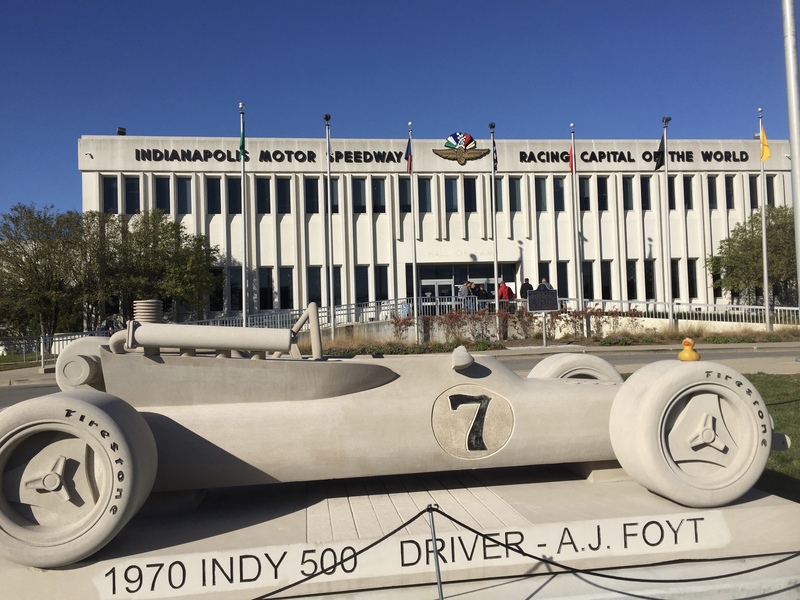 Perhaps the best known is the Indianapolis 500 race held annually the end of May. Also NASCAR race, the Brickyard 400 is held here. And this is the former home of the United States Grand Prix. Such an impressive place. Yep, we really are on the track of the Indianapolis Motor Speedway. Meet my new friend, our guide. He is so nice and tells us so much about this speedway. In fact, he tells us the first race held here, was not on this track. On Saturday, June 5, 1909, the first race was hot air balloons. The Balloon Universal City won the race, landing 382 miles (615 km) from here. Also, there is a golf course in the infield of this race track. I never knew. Here is the platform where a flag starts the race. Flag from this platform starts and finishes the race. From this same platform, a flag ends the race. I’m looking down the track here. Can you imagine driving at speeds approaching 200 miles per hour, with other cars all around you? These highly skilled drivers must have nerves of steel. 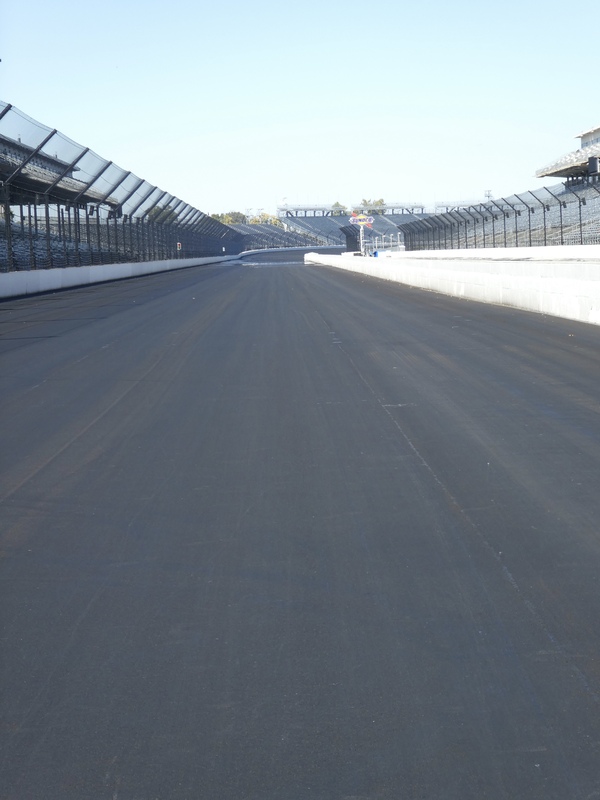 Shortly after the track opened and races were held, there was a problem with the surface of the track. To fix the problem, the track was resurfaced with bricks. Each brick was hand laid over 2 inches (51 mm) of leveled sand. The gaps were then filled with mortar. 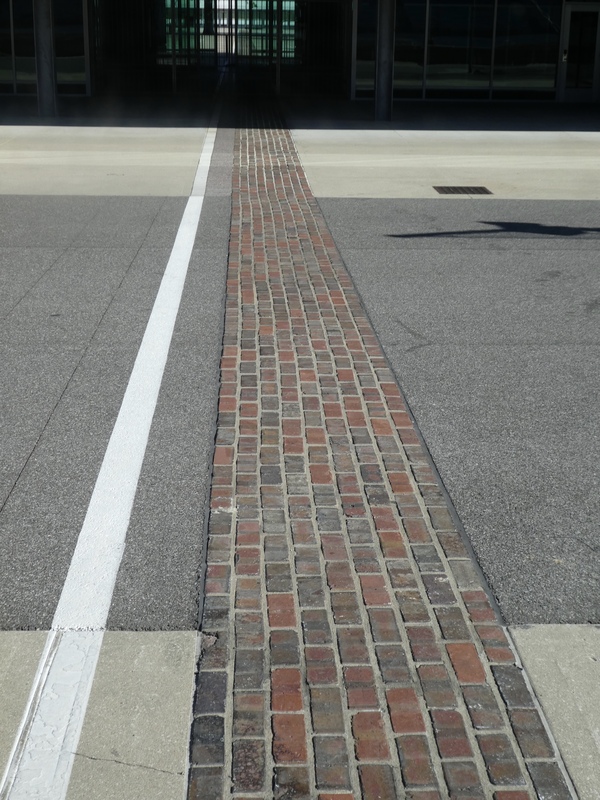 The track soon had the nickname of ‘The Brickyard”. Years later, the bricks were removed and the track was once again, resurfaced. However, this line of bricks remain. The brick strip is one yard (.91 m.) of original bricks. 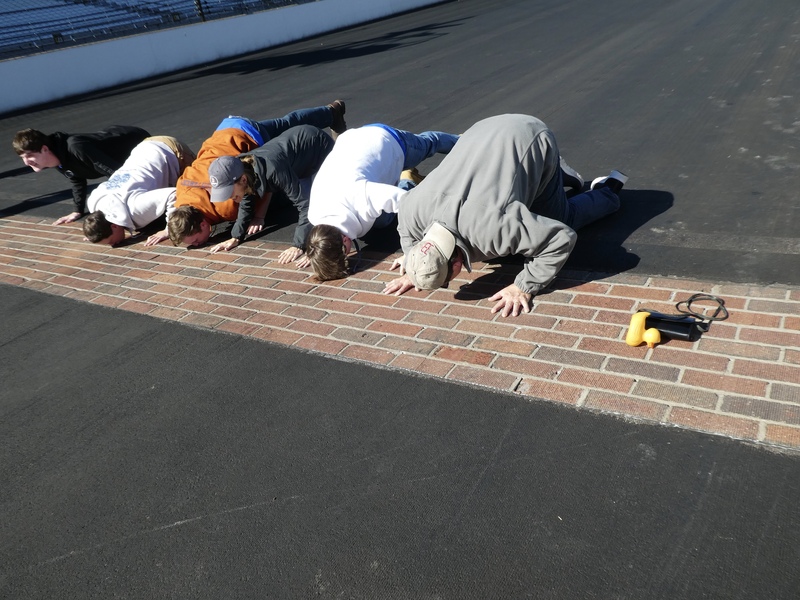 Custom requires that the winner, of whatever type of race, must kiss the bricks. 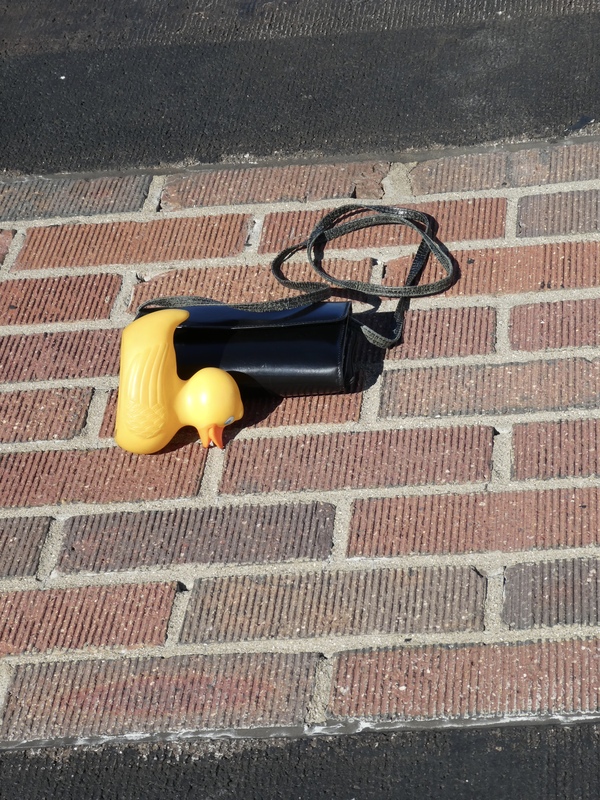 I, Zeb the Duck, follow tradition, and everyone knows that I am a winner, so I am kissing the bricks. Some of my fellow tourists, humans, are sharing my victory. We all kiss the bricks. Let me tell you a little about this speedway. There is permanent seating of 257,325 places. 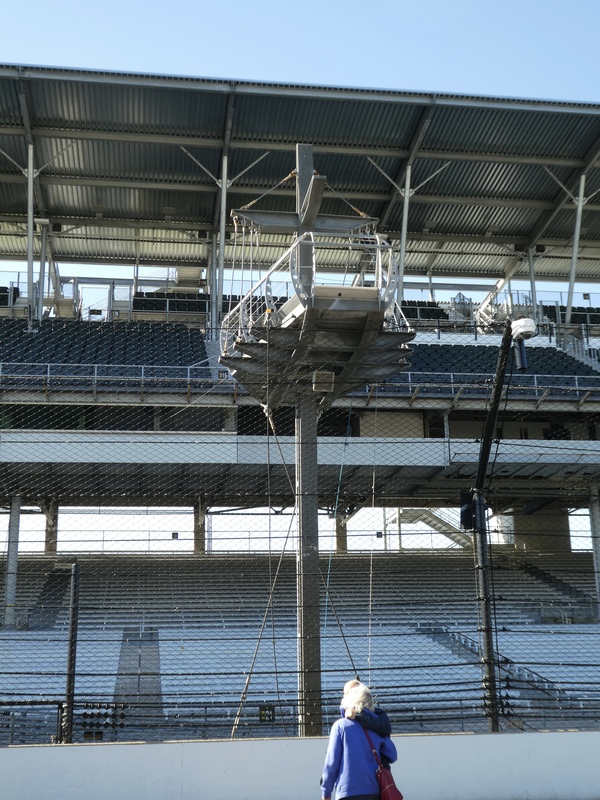 With the additional infield seating during most events, there is a capacity for 400,000 spectators. Right here, the Indianapolis Motor Speedway, is the highest capacity sports venue in the world. The track is 2.5 miles (4.0 km). The name of the major races includes the length of the race in miles. The Indianapolis 500 and the Brickyard 400. These are all day events. Our guide now takes us into the building and to the museum. We love this car. 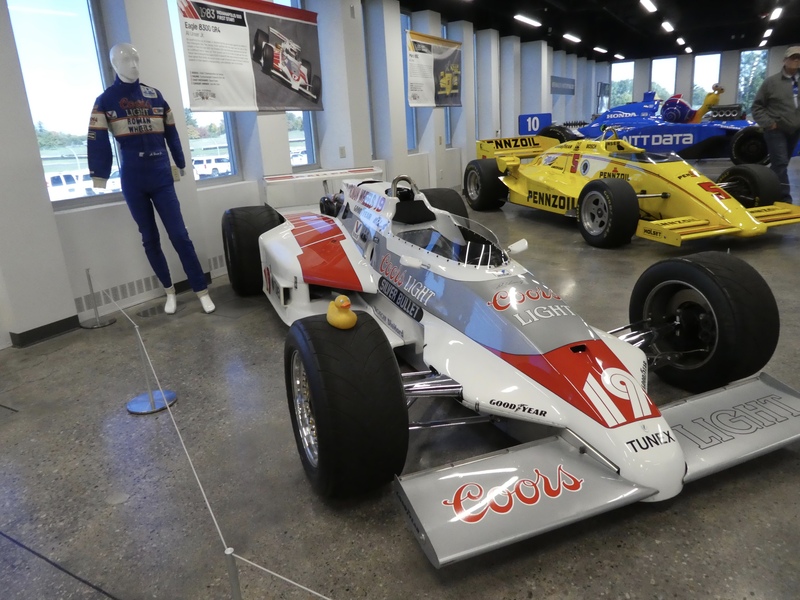 #19 car driven by Al Unser, Jr. This is #19 driven by Al Unser, Jr. 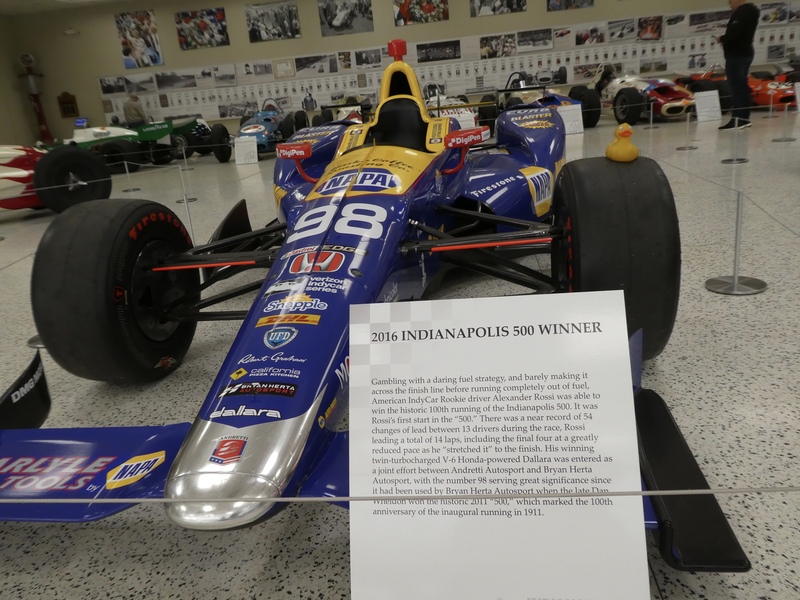 The Unser family is a legend in Indianapolis 500 racing. The car is sponsored by Coors Brewery. Coors Brewery, of Golden, Colorado, is a few miles from our home. This trophy is for the Indianapolis 500 race winners. 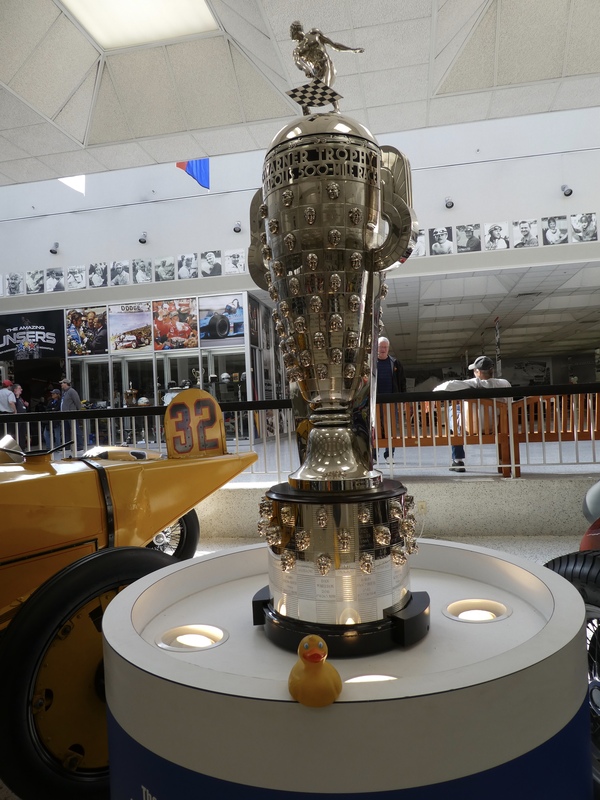 This sterling silver Borg-Warner Trophy has been symbolic of victory at the Indianapolis Motor Speedway since 1936. A silver likeness of each winner has been added to this trophy since 1936. To each winner, Borg Warner presents a smaller sterling silver replica of this handsome award. 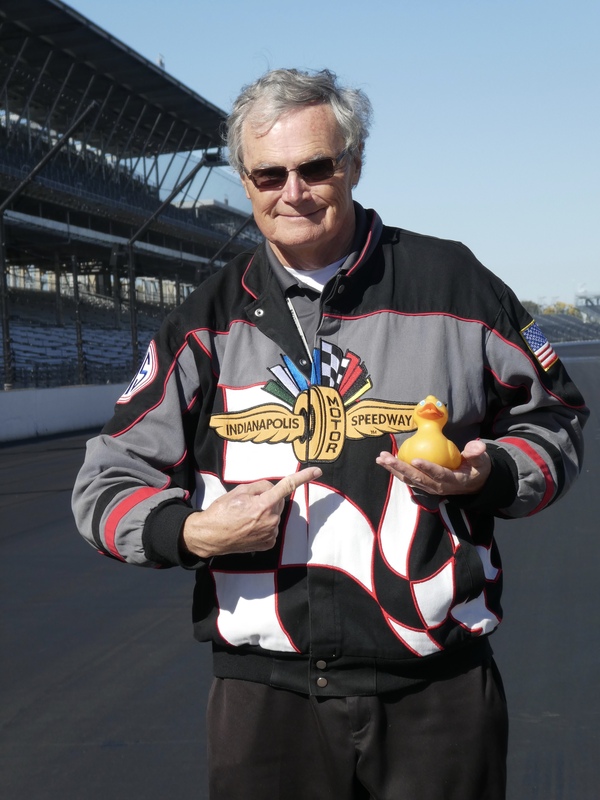 I like this trophy, but I don’t see any likenesses of racing or traveling ducks. So, I guess I will not be receiving a trophy this time. Look at the winning car from 2016. I like it and it sure doesn’t look like mom’s car. 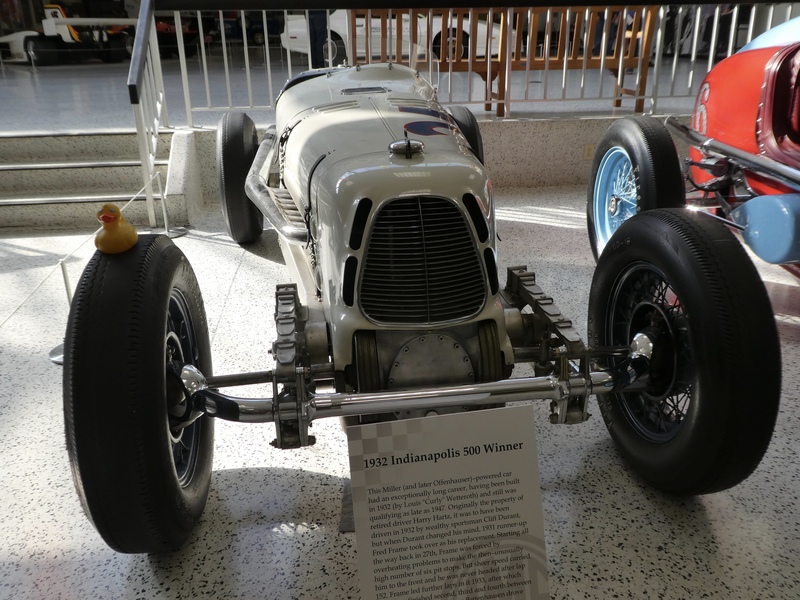 But, the earliest winning car I could find was from 1932. This also doesn’t look like mom’s car, but it doesn’t look much like the latest winning cars. The designs keep changing for more speed and more safety. 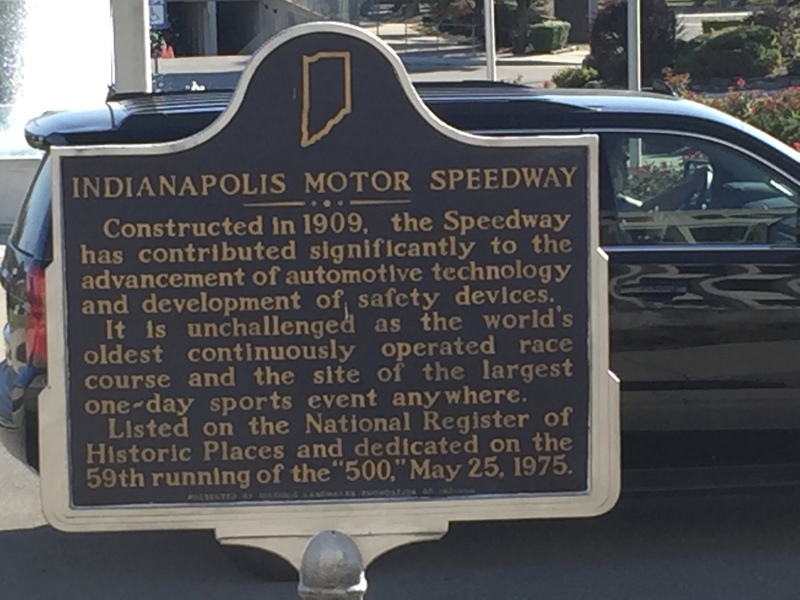 If you are near Indianapolis, I hope you take time to go the speedway and take a tour. This place is really interesting. I, Zeb the Duck, liked it and I think you would also. 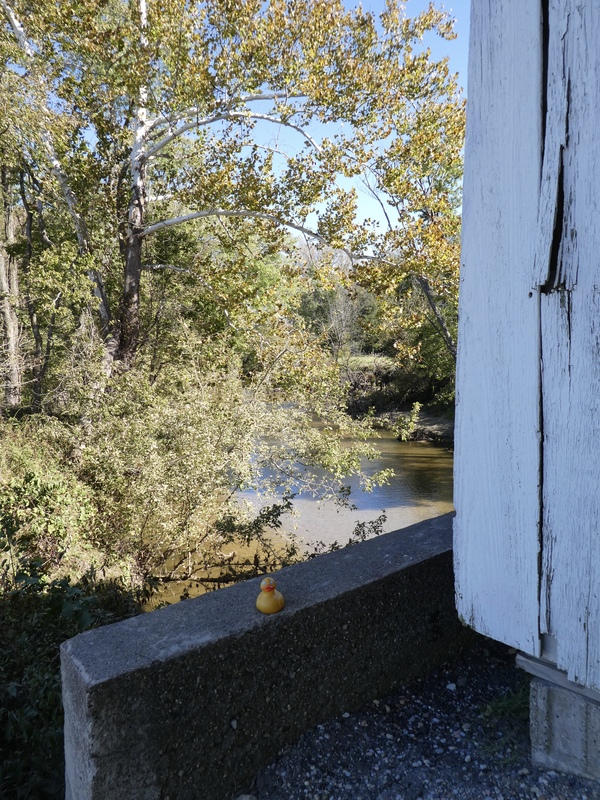 Zeb the Duck in Rockville, Indiana. More Covered Bridges! Normally we love to attend festivals, but today we planned to arrive after the festival was over. Sounds crazy, doesn’t it? We arrived in Rockville, Indiana late Sunday afternoon. After checking into a motel, we walked to the nearest covered bridge. But now I, Zeb the Duck, understand. Horses are to pass through the bridge at a walk. Isn’t this a perfect horse pulled cart? Cars, of course, can drive slowly through the bridge. OK, we are here in Rockville, Indiana as the Covered Bridge Festival is ending. The town of Rockville had a population of 2,600 people according to the 2010 census. A nice, small town. 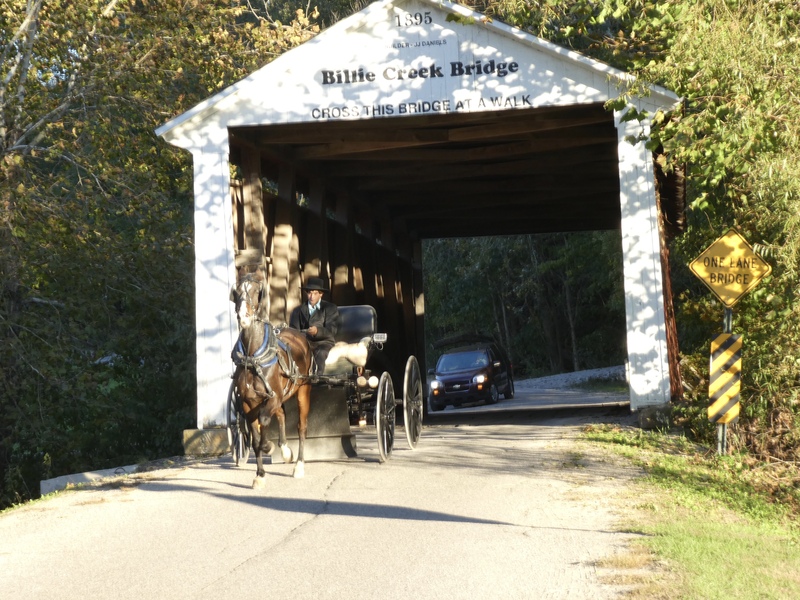 But the covered bridge festival begins the second Friday in October and lasts 10 days. During that time, there will be about 2 million visitors, according to the website. That is a lot of people! Let’s look around town first. The courthouse is a majestic old building. 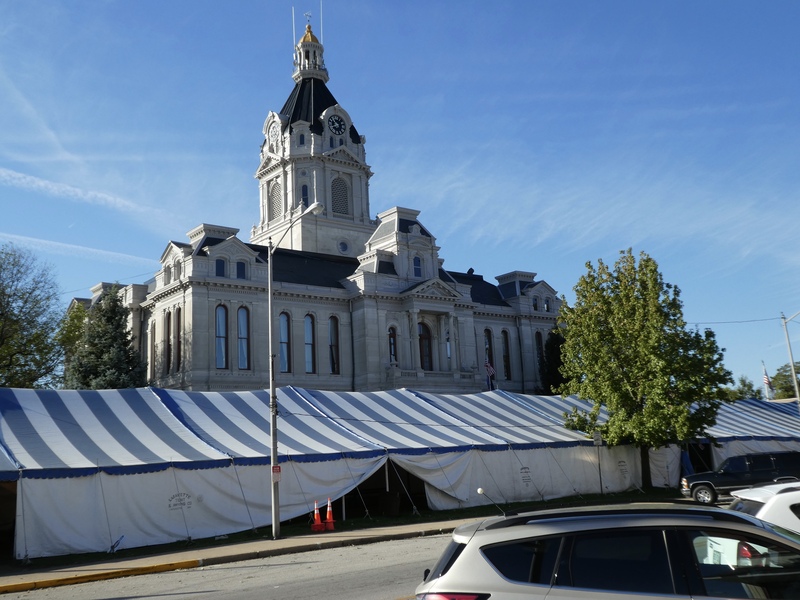 Here we see some of the tents used during the festival. We love decorations. 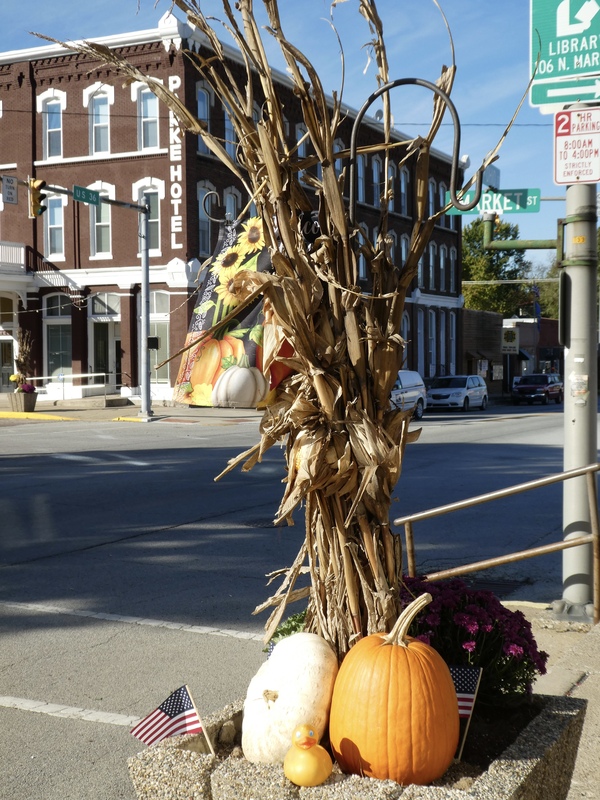 Autumn decorations abound in Rockville. Near the courthouse, we liked the Memorial Presbyterian Church. The town has many old homes that are still in use today. 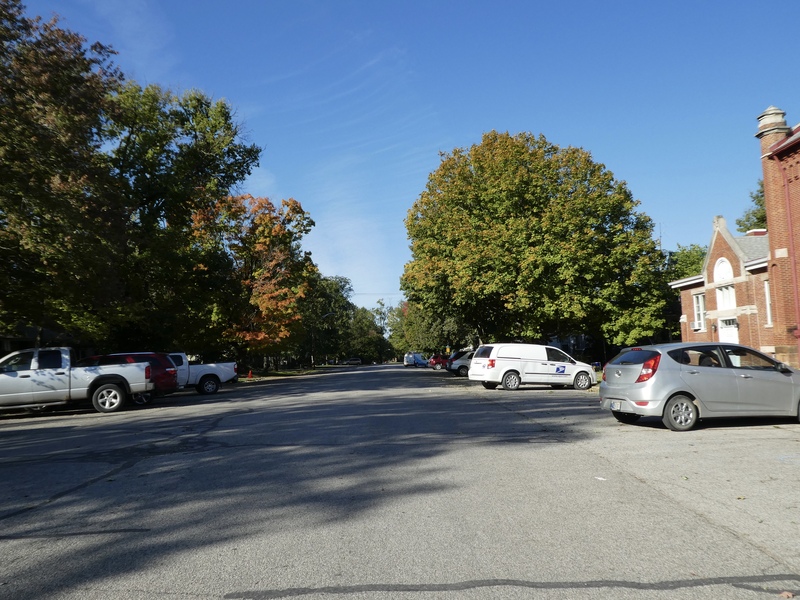 Look at these wide, tree lined streets. Plenty of space for 2,600 people, but too crowded for hundreds of thousands or even millions. 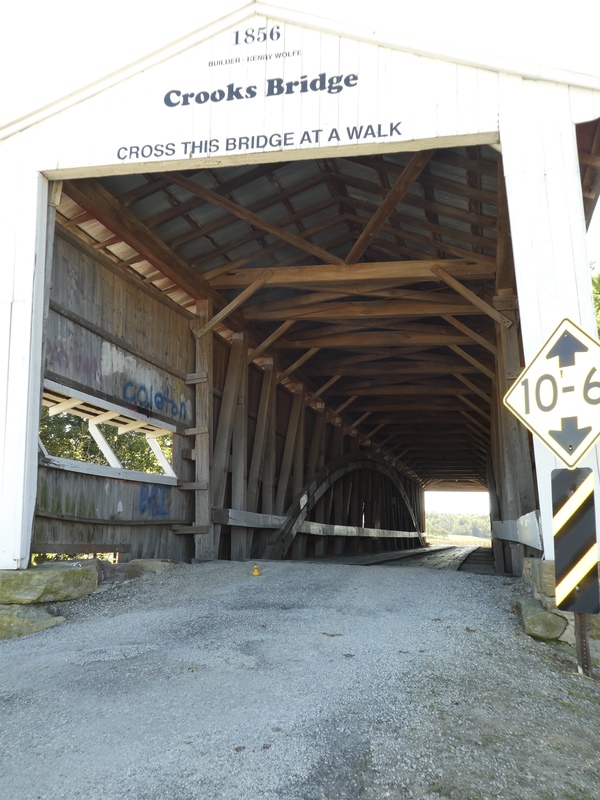 This county in Indiana has at least 31 covered bridges. The Visitor’s Center provides maps, with 4 recommended routes. 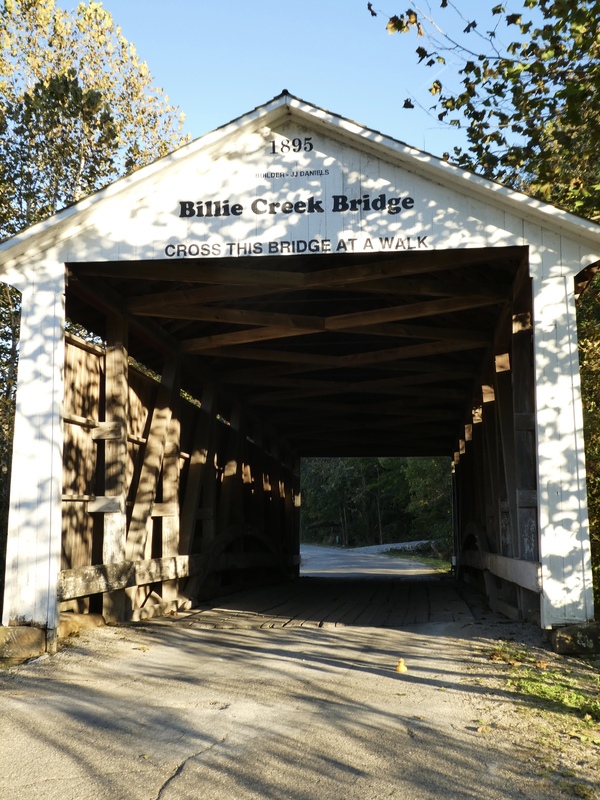 Humans can drive all over the county, following the suggested routes, to experience driving through covered bridges. We found some bridges Sunday night, but did more driving Monday morning. Here is Crooks Bridge. I like bridges with windows. This part of Indiana is farm country. Tractor in use. This is farm country. 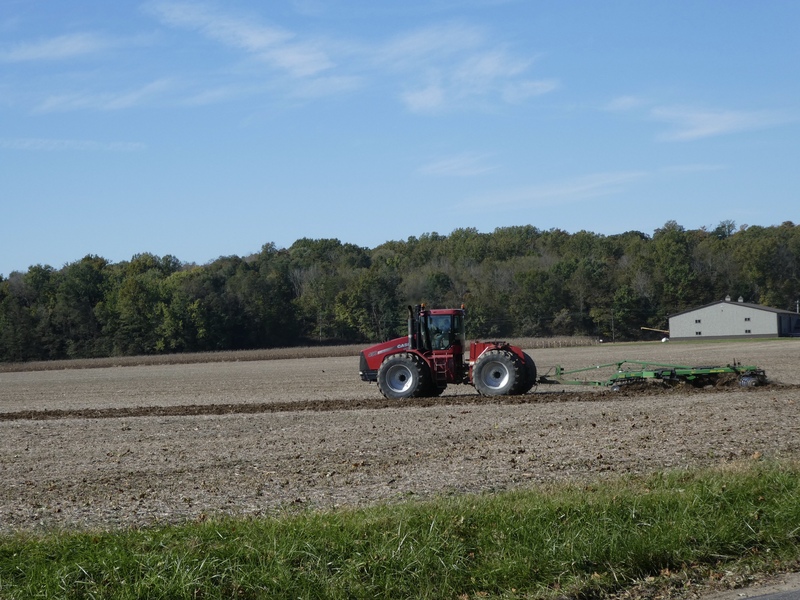 This farmer is working on his tractor today. Farming is hard work. 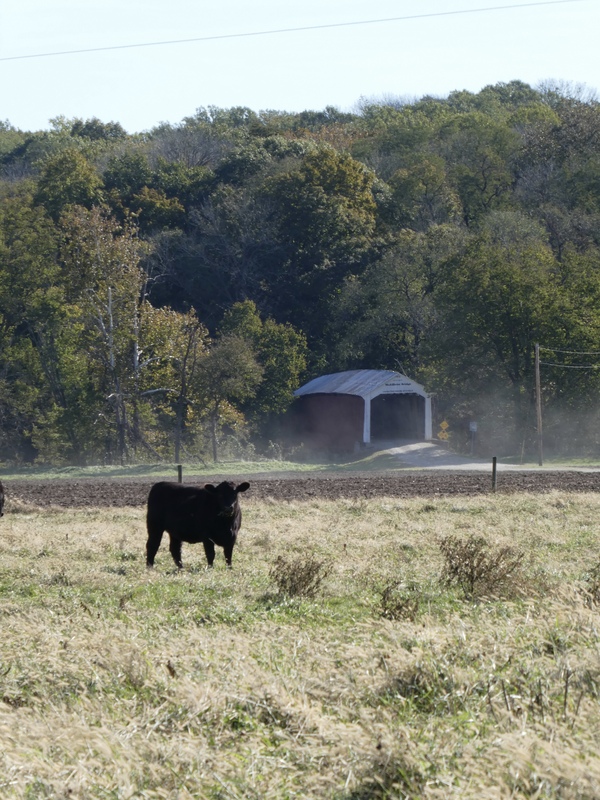 This farm has the barn with cows and a covered bridge in the background. Definitely farm country. Barn on left. Cows with covered bridge in background. You can see the dust from a car that just drove through the covered bridge. 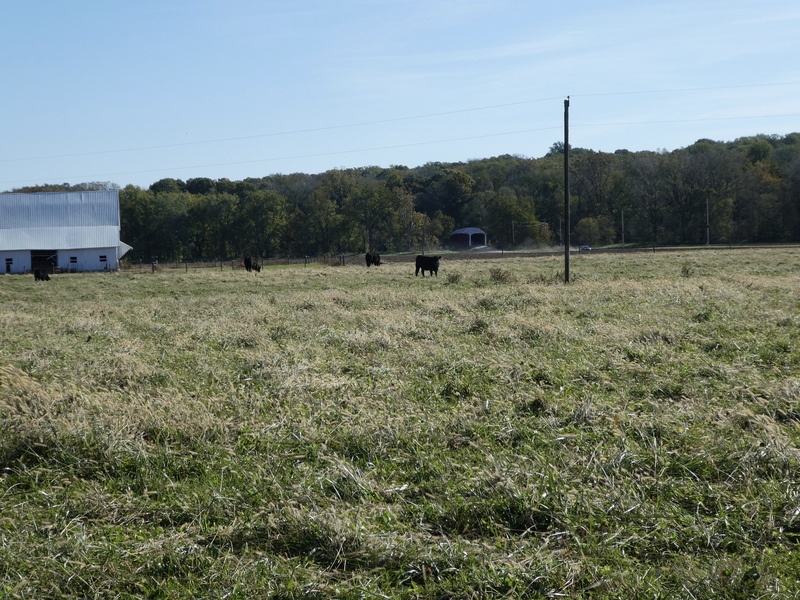 Of course, farms mean cows, and we like cows. This cow lives and grazes near the McAllister Bridge. I, Zeb the Duck, wanted to remind you that these bridges are necessary. This one allows passage over the river. This trip we just wanted to see the covered bridges. We were not particularly interested in purchasing items, but maybe next time we will come during the festival. We hope you enjoyed festivals and autumn drives this year. We like them.